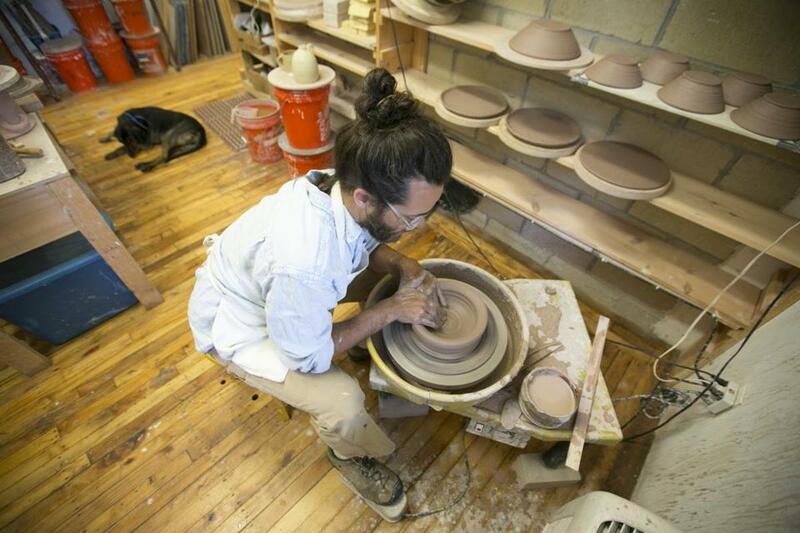 Jeremy Ogusky at work in his Needham studio. NEEDHAM — Fermentation, from pickles to kimchi and its many variations, is the new buzz word among food enthusiasts and restaurateurs. Jeremy Ogusky laughs at the newfound popularity. “It’s having a moment,” he says. 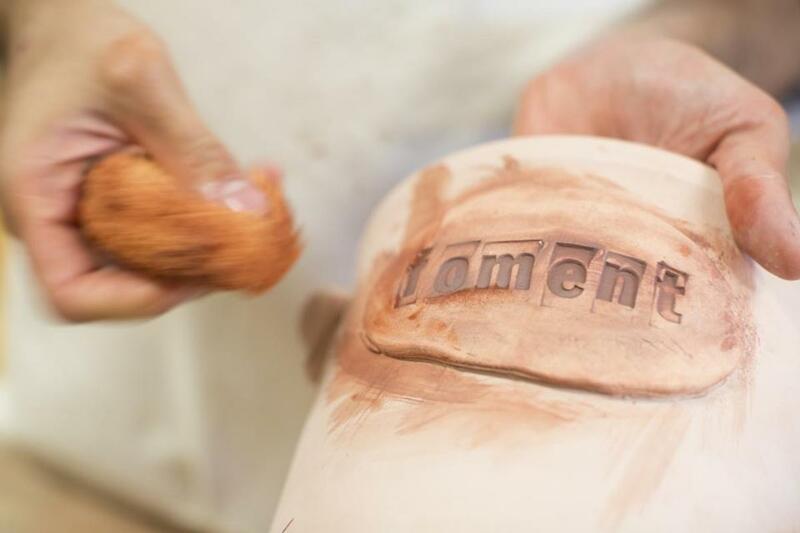 In the past three years, the potter has developed a following for his crocks, playfully inscribed with “ferment, foment.” The vessels, shaped like cookie jars, are designed for home fermenting. “I started making these crocks for myself, and then it sort of just spiraled upward from there,” he says. He now sells crocks to Williams-Sonoma (the cost is about $80), and they’re also available at Brookline’s Allandale Farm. Ogusky also cofounded Boston Ferments, a collaborative of live-food enthusiasts through which he helps organize the Fermentation Festival at the Egleston farmers’ market in Jamaica Plain, and regularly teaches workshops. “It is readily apparent that he thinks big, and he goes for it,” Kate Peppard, cofounder and director of the Egleston market, writes in an e-mail. The two bonded over a shared interest in fermentation, and envisioned the market as a platform for teaching. “The idea of demos quickly escalated to the full-fledged concept of a fermentation festival,” she says. This snowball approach seems to be Ogusky’s trademark. He wanted to thank Sandor Katz, the well-known author of “The Art of Fermentation,” for inspiring him. A few years ago Ogusky sent Katz a crock, and, says the potter, “He used it! And took a photo of it, and put the photo in his new, big coffee table book.” Katz gave Ogusky credit under the photo, and “through that I think a lot of people have found me,” he says. 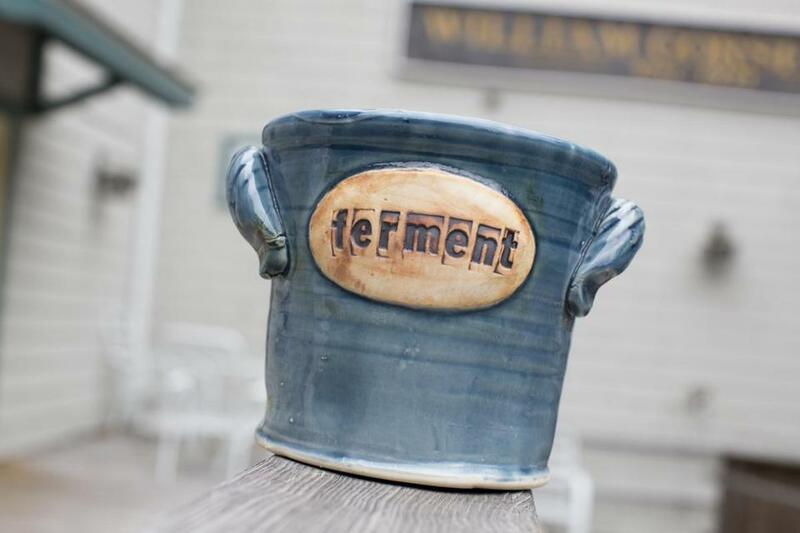 Ogusky playfully inscribes “ferment, foment” on his fermentation crocks. With long brown hair pulled into a lopsided bun, a full beard, leathery hands, and patched Carhartt workpants, the potter exudes a rugged gentleness modernized by hip, clear-framed glasses. Flanked by Pula, his friendly bandana-clad mutt, Ogusky shows off his tidy Needham studio, which he recently purchased; it’s one of a number of artists’ spaces housed in an old mill building. Black-and-white photographs of women in petticoats making stockings during the building’s industrial era line the hallway. Ogusky’s studio is an organized (albeit clay-dusty) space with a wall of windows, and shelves of brightly colored pots-in-process. Before pottery, Ogusky had a career in public health. He earned a master’s from Boston University, and became a Peace Corps volunteer in Lesotho, southern Africa, where he met his wife, Siiri. After two years of HIV/AIDS work, the pair moved to Ecuador, where Ogusky taught public health at the college level., then he worked in public policy in Washington D.C., and returned to Boston to work in public health education at Harvard. Five years ago he lost his job. “I felt, actually, really relieved.” His wife encouraged him to pursue pottery, a lifelong hobby. “It was a big change,” he says. At the fermentation workshops he teaches, Ogusky explains the politics, economics, history, and culture that surround this method. “Fermentation is a great window into all of these other issues,” he says. Indeed, many have caught the bug. Kari Pierce can be reached at kari.elise.pierce@gmail.com.